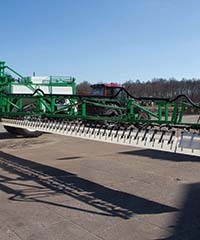 Crop-Spraying System Utilizes ACE Hydraulic Dampers – ACE Controls Inc. When you spray pesticides on crops, the chemicals don’t always land where they’re supposed to—a phenomenon known as drift. Foggy clouds of pesticides and water float into the air during the spraying process, oftentimes due to wind or uneven ground. That’s where the Wingssprayer comes in. This crop-spraying system reduces the amount of chemicals needed to effectively protect crops, benefitting both the environment and the farmers. Because of its large wingspan, however, vibration was an issue. Here’s how hydraulic dampers from ACE Controls overcame that challenge—while helping both farmers and the environment in the process. Drift creates a number of problems. For one, farmers require more costly chemicals. Because the amount that reaches the crops isn’t guaranteed, plants also tend to receive too much or too little—resulting in smaller yields. And finally, the excessive, wasteful spraying is harmful to the environment. The Wingssprayer solves these problems. The concept is simple: the Wingssprayer integrates wings—much like the ones on an airplane— that push the plants down during spraying, creating downward streams of air that steer the chemical droplets into the deepest parts of the plants. In addition, these aerodynamic airstreams form a blanket of air over the crops behind the machine, preventing the drops from escaping. And finally, it sprays small droplets which, as opposed to the traditionally sprayed large drops, completely cover the crop with a fine mist. But the Wingssprayer doesn’t just rely on wings. To operate safely, it utilizes hydraulic dampers (type HB-15-25) from ACE Controls. Otherwise, the sheer size of the Wingssprayer would cause it to shake during operation—to the point where the machine could damage itself. The dampers, which resemble industrial gas springs, are adjustable—enabling engineers to stabilize movement in both the push and pull directions. ACE delivered a double-acting variant capable of a maximum compression force of 179.85 pounds, stabilizing the machine even on very windy days. Since integrating these components, the machine has operated safely and efficiently—and to this day, continues to have a positive impact on the environment.